The sounds were like hisses. The kind a soda bottle makes when the cap comes off fast. 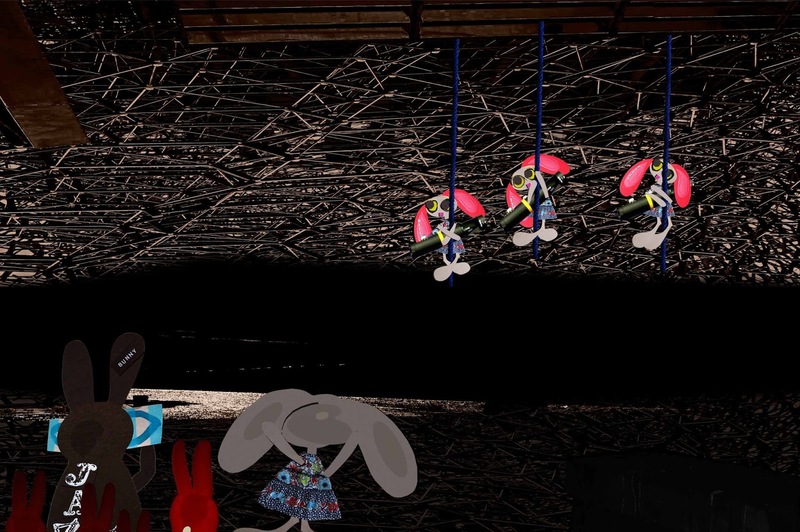 The Wabbit knew the sounds and he felt his paws sting. "What the Wopsie ..?" said Magic Red Rabbit. Lapinette thought Red Rabbit had been with them too long. "Get ready," she said. "If they can come down, then we can go up." Magic Red Rabbit stared at Fitzy, Mitzy and Tipsy. "What are these things they're carrying?" "SubRocks," said the Wabbit. "If these go down, then we'll all go up fast!" Fitzy, Mitzy and Tipsy dropped from the ropes and pointed at everyone. "All. Up!" shouted Tipsy. "Go doodly go!" shouted Mitzy. Fitzy placed the depth charges in the water, turned dials and yelled. "Boom Boxes Away!" The wakes the charges left looked like shark fins as they sped up the cavern. "Good grief," muttered the Wabbit in horror and they all hopped for the ropes. A thousand red rabbits sped after them and they could certainly climb. Fitzy, Mitzy and Tipsy grabbed the ropes and shimmied roofwards like ferrets up a drainpipe. They were all near the top when they heard a low rumbling. Then water convulsed as three explosions turned the underground lake into a liquid fireball. In the distance they heard some kind of awful shrieking and momentarily covered their ears with whatever paws were available. "Fuzzywig!" said the Magic Red Rabbit.